The stirring of dress desire is a sure harbinger of spring. Even women like me (for whom finding a ready-to-wear frock that fits is difficult), long for one once winter retreats. Now is the time to look, with new dresses arriving in stores and online by the day. A safe dress is in the eye of the beholder, but I'll apply the standard I use for corporate attire: it stays put and offends no one. This Talbots ponte knit dress, $125, would qualify, and might serve well worn with accessories. Probably in a year or so, a few pulls in the rayon/nylon/spandex would relegate it to the recycle bin. Milly's Jenny ponte dress: loads more wit in its knit; $365 from Nordstrom. We all need the safe dress, but also one that makes you sigh with pleasure every time you wear it. I had a black cotton full-skirted shirtdress with leaf-green piping. Cost the earth even on sale– and so what? I wore it for at least six years. A smokin' dress fits your body and your soul. Here are some I'd choose, from expensive to less so. Make a least one of your dresses a goddess of the closet, presiding with grace and generosity. Akris Marina Grande-Print dress: this seaside print on Swiss cotton provides novel charm. The price, $2,990 is about the cost of actually going there, so I'm showing it for edification. You can buy it at Saks. Diane von Furstenberg's Alexy silk jersey dress, with the same print in two colourways. I don't see only a thin woman wearing this, either, as the pattern keeps the eye moving. A modern, fresh dress and silk jersey travels wonderfully. Price, $325, also at Sak's. 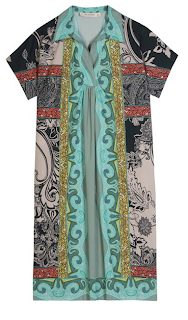 Must show this Etro shirt dress even though s/o in larger sizes at mytheresa. But if you are choosing pattern, this is an object lesson in colour design. Price, $890; washable. 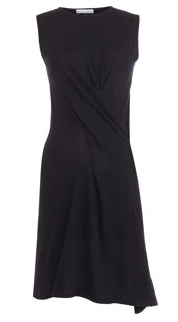 Catherine Malandrino's navy deep-v pointelle dress is discreet and alluring at once, a hard-to-find effect. It's lined to the lower thigh, and stretchy enough to fit closely but not cling. (If a knit is well-designed, one does not have to be superslim to wear it.) Price, $495 from Saks. Ann Demeulemeester's faux-wrap black cotton knit dress is unadorned, yet lightyears away from a stiff, safe sheath. Price, $259; from Barney's. Whew, I heart this dress! 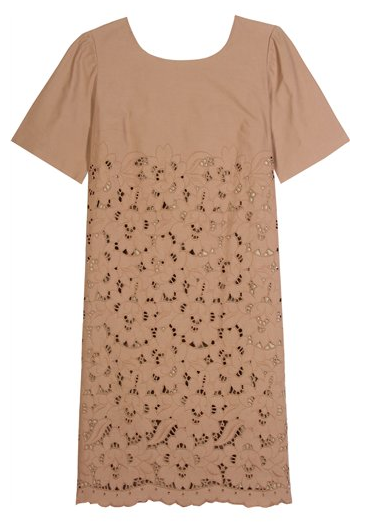 In the pales, here's a See by Chloé ecru jersey dress with contrast details, boat neck and button shoulders, very Geoffrey Beene. Price, $396 from myteresa. The dress that shines by way of its fabric, perhaps "prettier" than you're used to wearing, but you'll get compliments every time. 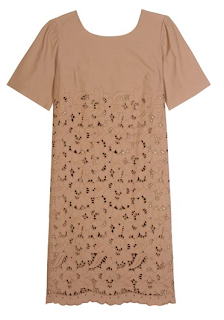 Peggy Lutz' Cocktail Slip Dress in antique paisley panne velvet is a gorgeous dress for a wedding (perhaps with a pashmina), the opera or even the market if you are in a cheeky treat-yourself mood. In size XXS (12-14) to 5X; price, $480. Anna Sui's floral-print cotton and silk-blend dress has a crepe-trimmed neck and hem. 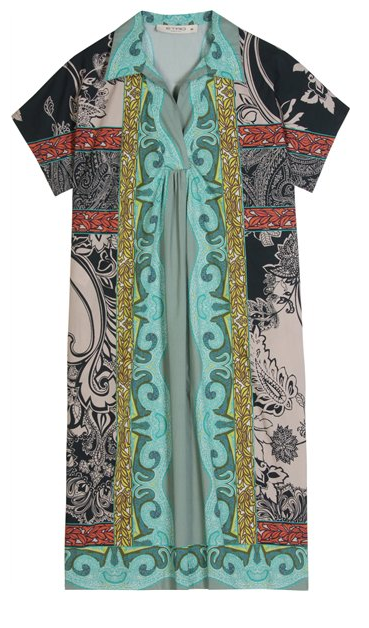 Channels the '70s but would never be mistaken for a dress you didn't throw out. 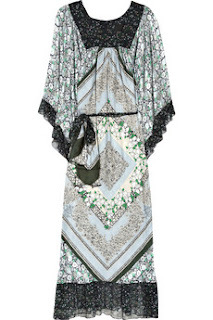 I see it on a mother of the bride at a garden wedding, but it could just as well be worn for lunch on a patio. 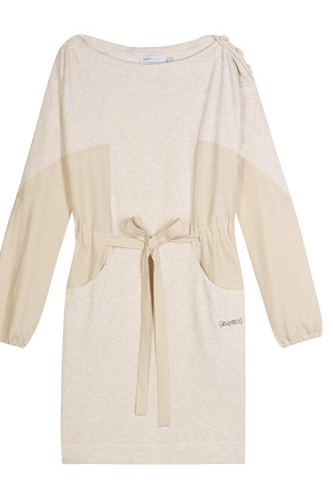 Price, $650 from Net-a-porter. Stella McCartney knows how to dress grown women, period. Fawn cotton lace, rounded neckline, slightly flared cut. Expensive, yes–but you don't find exquisite lace on the cheap. Lace Dress, $1,227 at myteresa. You may not suit these exact choices (or they may be sold out, an annoying fact of life); I chose them to illustrate the smokin' dress principles. Finding the perfect dress is somehow more challenging than finding good jeans or a just-right tee, and in its own category of triumph. I wish us luck. Oh, that Ann D's calling my name, but from what I understand, she designs very TALL. 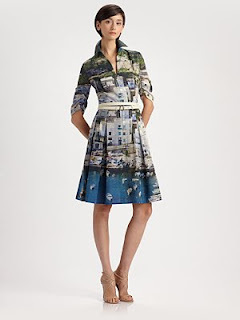 I've gone back and looked at that Akris marina print dress several times...not for me but such a witty piece! I've ordered the Talbot's "Bardot" dress (the blue linen one in all the ads) to try. Thought it would be a good casual dress for travel (I don't care too much about wrinkles...that's the nature of linen). Will report when it arrives. Great post and fabulous choice of dresses. Would also be interested in seeing your green leaf piping shirt dress, sounds interesting. Pseu: I had wondered about that cap sleeve, will be eager to hear your report. coffeeaddict: Dress was sold at a consignment store a long time ago, hope someone else is as happy as I was. The only one out of your collection that I want to wear is the Akris. Sigh. And instead I just bought new shorts:). Never have cared for dresses unless I'm dressing up. Thank you for posting this! It's always so difficult and so rewarding to find a smokin' dress. Your black cotton shirt dress sounds dreamy and just the thing I'd like to find. My eyes and heart opened right up at that Catherine Malandrino dress: it's simply perfect. Now I need to find out if it will actually fit me. Quite a cavalcade of dresses! Thanks for displaying them all. All those interesting painterly prints would wear me, I'm afraid (though I'm obsessed with Stella Mac's Botanical series--have you seen them? Big, vivid blooms on white backgrounds, just gorgeous.) I'll be looking for the things that always feel right in spring/summer dresses for me: easy fit, light, cool natural fabrics, flattering necklines and colors--rare treasures, the more so as I get older and want more coverage. A couple of years ago I found a white cotton poplin shirtdress at J. Crew: full-skirted, with a big nautical pattern of ropes & anchors in black just above the hem--the perfect place for pattern for me. This year I think I'll spruce it up with Talbot's great black leather wrap belt (shown with the indigo linen skirt) and give it another whirl. But I'll still be looking for this summer's special dress. Good luck to all who are hunting! the range of choices offered...must encompass most tastes...great work! Northmoon: Designer dresses are expensive, which is why so many women choose separates. LPC: Shorts and dresses are to me two different animals, and nice animals both. If I could wear shorts well, I'd be shopping for them, too- but they are off my radar these days. HB: The black shirtdress was by Chacok, uncharacteristically sober for the line. I've always gotten a lot of wear out of navy or black summerweight dresses and have wrecked a few pale ones. Anonymous/C: Almost chose that Stella botanical dress for the post! Your shirtdress sounds wonderful. hostess: Thank you, now if only I could find one. These dresses would be too short, but I do not want a floor-length maxi. I find it hard to buy dresses because I'm petite and straight up and down, so many cuts make me look like a fabric sausage. I like the Milly dress - the only patterned garments I ever wear are tops, so I can't imagine myself in any of the others, except the faux wrap (see sausage comment!). I think I'm very staid in my choices; sometimes I wonder where the line between staid and classic lies! Tiffany: Staid is safe on steroids, and sometimes (a court appearance comes to mind) staid might be what we need. Usually though, it doesn't lift one's heart. Cling is the enemy but skim is great. Love many of the dresses, but particularly the DVF dress. In contrast it seems almost reasonably priced. Dresses are really my favourite way to dress, but for now I'm going to shop my own wardrobe -- fun to window-shop here, though. I'll be keeping an eye out for the next few months for the perfect mother of the bride dress (very small, private-club wedding, so I can indulge in something I'll wear regularly afterward). I love dresses but haven't worn many for a couple of years as they are far to often to short either in the bodice or the total length. I love designer selections but often the size is too small; for example that Ann D dress would be long enough but is not available in my size. Love Stella McC, and I did splurge on one of the floral frocks in December when I still had the money (before the reality of having full time caregivers for my spouse cut in). I haven't worn it outside the bedroom yet. I was originally told it would arrive in February (pre-order) but it arrived in December, now I just slip it on in the morning when I need a lift and a promise of spring. But spring will come and I have no regrets. It may well end up being the only thing I can buy so at least it is something I love. You have pinpointed a need that my closet does not fulfill; a really smokin' dress. I only own four dresses (my two $35.00 cotton numbers for deep Summer don't count) and none of them really work for me. They all need to go. I need to replace them with one smokin' dress that works my figure to its best advantage. I really appreciate how your post helped me focus my sometimes fuzzy fashion thinking into a coherent plan. Mardel: The McCartney florals are magical and are already the "waiting list" dress of the season! Lucky you, hope you post a shot of you modeling it! laurieann: Good. I usually end up buying a dress just b/c it fits, but have set my sights higher- even if I have to have it made.